Dark Eldar + Vampire Counts? So I'm still working on the fluff but I like the idea of my Coven units mimicking Necromancy in some ways, flesh sculpting and bone sculpting to create some horrifying Grotesques and Pain Engines. Another idea I like is having some of my troops who were slain become some kind of Graveguard who were resurrected imperfectly and serve as Trueborn or some other Kabalite alternative. 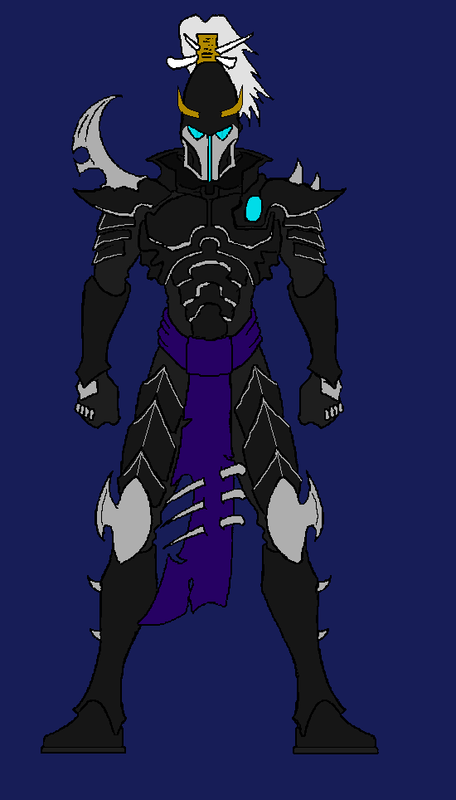 For this I was thinking of using Dark Elf Executioner heads for that. So if you could throw ideas or models at me to aid me in this that would be fantastic. Theme wise, you could go the full Herbest West and say your Haemonculi have developed an elixir which temporarily animates the dead. This way you get your shambling, corpse-like creatures. Mixing in a few zombie parts would probably be enough for you, just giving them all a nice look of decay and shambliness. Just want to say that I love this idea. For a start, a lot of DE are comparable to vampires already (steal life from others to fuel their powers, usually creatures of dark/night, fast, skilled). Where they fall down is in strength and resilience (although Soul Trap may make up for the latter). What's more, the Haemonculi regeneration technology is almost indistinguishable from straight-up resurrection. You could fluff it that the Archons want to increase their strength and resilience (on a permanent basis), but so far increasing strength and resilience has resulted in loss of agility and mental capacities (hence grotesques and Talos/Cronos). Necromancy could be an offshoot of the regeneration process, possibly sped up in some way. This has degenerative effects on the creature's physical and mental abilities (hence many being augmented with additional machinery/drugs), but since they're expendable this is largely irrelevant. Also, given that you can just resurrect them again, who cares? Modelwise, if you use zombies of some kind for troops, you could try to find some sort of machinery to go on each of their backs (or heads). Basically giving the impression of parasitic machinery that animates them and keeps them on their feet. In terms of grotesques, I believe people already use https://www.games-workshop.com/en-WW/Flesh-Eater-Courts-Crypt-Horrors for Grotesques. Add some talos bits and you're good to go. Really though, you could probably get away with any big model with a bit of augmentation. I might have some more ideas for you tomorrow (sorry, I know I've rambled a bit), but now I'm off to bed. Shredder I absolutely love your ideas here, I wasn't sure how I was going to implement it so thank you! If you'd be willing I'd actually love to hear some more of your ideas for my Kabal (It's kinda being overhauled to fit the Necromantic theme). The morghast are too big for grots and big by talos standards. But I use 2 in my dark artisan and they look great. 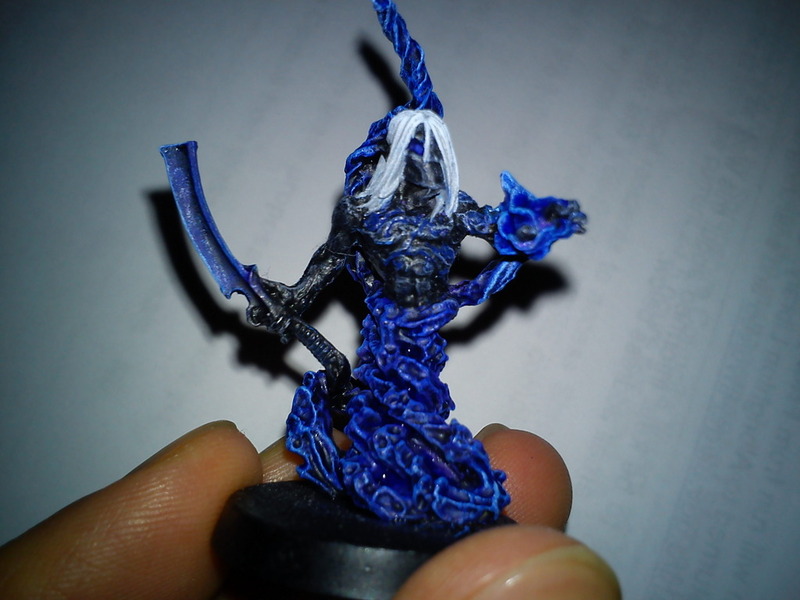 I also use nagash as a slightly converted wraithknight. I run mine sword and board for minimum cheese. Shredder I absolutely love your ideas here, I wasn't sure how I was going to implement it so thank you! I think they're a bit big for Grotesques, but I imagine they'd be great as Talos or Cronos. I don't know if you'd want to try and add some of the mechanical stuff from either the Talos or Cronos or just leave them as they are. Personally, I think they'd be fine either way. If you'd be willing I'd actually love to hear some more of your ideas for my Kabal (It's kinda being overhauled to fit the Necromantic theme). First off, if I might stay into rules for a moment, have you considered using some Corsairs? You mentioned your Archon becoming a Corsair, but I wasn't sure if that was just fluff or if it extended to rules as well. 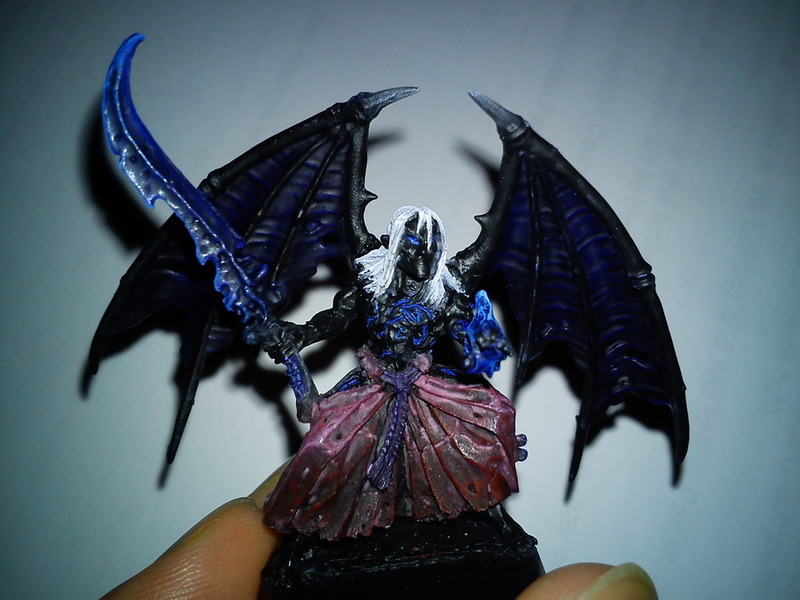 I ask because I think the Corsair Prince could make for a really great Vampire Lord to lead your army. What's more, lesser versions of those powers can be passed on to other characters or units in the Prince's army. So, you could effectively turn them into lesser vampires or thralls. Other Corsair models of note are the Void Prince (could maybe represent a Necromancer type caster) and Malevolents (can have Jet Packs and represent were-bats, mutated vampires or something to that effect). Something else you could look into is Cryx - https://privateerpress.com/warmachine/gallery/cryx. Their entire theme is basically necromancy + technology, they might well have some models that will fit your army. The only thing I'll say is watch out for the base sizes of models (they have 30mm, 40mm and 50mm). In terms of fluff, are you looking for ideas for anything specific at the moment, or just for general ideas? I'm open to both specific and general ideas at the moment. With my Kabal I had some concepts that I love and I'd like to find a way to make a coherent and fleshed out idea with said Kabal. I really liked the idea of having my Archon be fascinated with the idea of a Eldar Empire and going on a crusade against chaos in the process. I know double posts are frowned upon but I've been playing around with Color Schemes and I have these 4 templates I'd like to share and get your views on it. EDIT: The better red pictures are below so if you vote please vote on those. The Red gives it a more powerful feeling especially when paired with gold to give it a very regal feeling at least in my opinion. It also pairs well with the Vampire aesthetic. Meanwhile the Blue gives me more of an ethereal vibe and it certainly pops, when paired with the Silver it kinda reminds me of the scourge from Warcraft. Corsair rules are in Forgeworld's Imperial Armour The Doom of Mymeara, you will want the second edition not the first. I would say I'm a fan of the second from the bottom. With regard to the colour schemes, I quite like the contrast of white on black (I've always liked the Ulthwé colour scheme). As a question though, have you considered switching out colours a bit for different models? For example, you could use the white trim for the standard troops and then have a gold trim for leaders. In terms of the face, the blue stands out a lot more (but that might be because it's brighter than the red). I think the red goes with the overall scheme (not to mention the theme) better, but I'd consider using a brighter shade. I think this one doesn't stand out enough against the black(ish) armour. So I tried to edit it and post the updated red images earlier, sadly that didn't work, possibly because it was an edit. But here is the updated red images. The red certainly pops out more now. Yeah, I definitely prefer that red. It stands out a lot better. What are your thoughts regarding white vs gold? I think the red looks a little more vivid against the gold, but I still like the white/black motif in general. I like the idea myself and I've toyed with it but I'm not sure how unified the entire look would be. One thought I had similar was everyone have the base silver trim but the leaders have the golden detailing along with the Silver trim. Although to unify things a bit I could put a small golden detailing on everyone just to make the color more prevalent throughout the army...not to much though as the leaders need to stand out. The downside to that idea though is that I'm not sure how much of the Purple and (Red or Blue) I'd be able to do then, because of the color overload and my lack of experience as a painter. the other news is I'm trying to figure out what I'm going to use as Sslyths, because their models are so limited yet I'd like to be able to use them, so either conversions or a bunch of carbon copies. Suggestions? 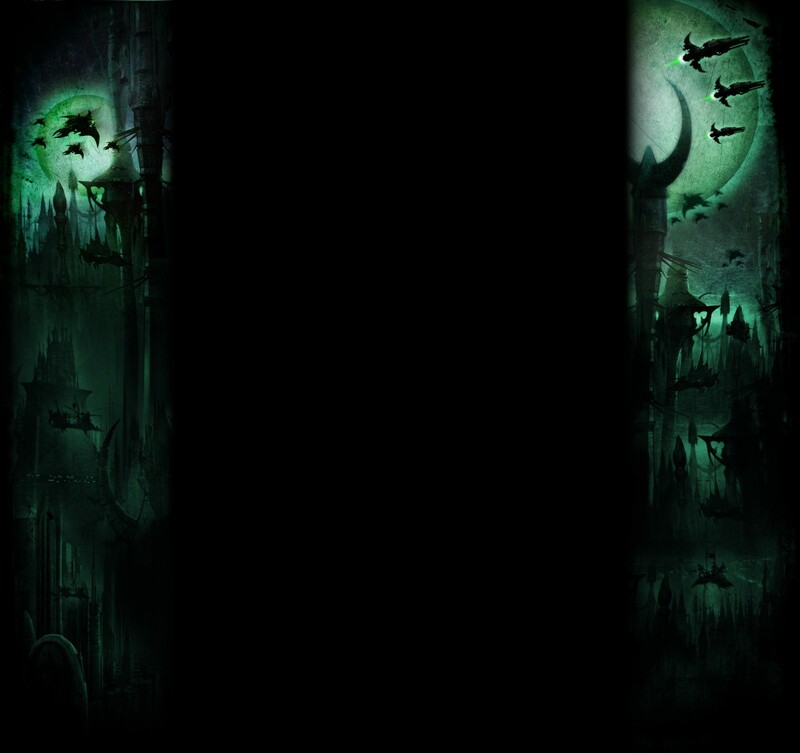 Subject: Re: Dark Eldar + Vampire Counts?